[1:11] <kenrestivo> does the 4.x kernel suport pinmux for setting interrupt edges? [1:12] <kenrestivo> i.e. through dts using the &gpio facility? [1:13] <kenrestivo> als9, for setting internal pullups? [4:48] <annoymouse> How can I run raspi-config from Scratch? [6:20] <Xark> annoymouse: Can you ctrl-alt-F1 or similar to go to text console? [7:13] <Katronix> Hi all, does Raspbian still use LXE? I'm trying to get something to run automatically I found http://www.raspberrypi-spy.co.uk/2014/05/how-to-autostart-apps-in-rasbian-lxde-desktop/ and the first version it offers is not working. [9:27] <votetrev> hey guys anyone in here who is knowledgable with retropie? [11:25] <zoldyck_clone> is this fixed in RPi 2? [12:07] <at0m> zoldyck_clone: got an example i can try to play? [12:14] <Keanu73> real time clocks ARE expensive. [12:21] <Keanu73> so /etc/init.d/ntp enable? [12:22] <Keanu73> Raspbian is based on Debian Wheezy, correct? [14:03] <btorch> morning anyone here done a raspberry pi to be an ubuntu kickstart server ? [14:05] <aditsu> hi, what's the general opinion on the Orange Pi? [14:11] <aditsu> Berg: what "39 US"? [14:14] <Berg> you looking at a older version? [14:16] <Berg> 15 bucks what you gona do with that though? [14:19] <E765> What other essentials do I need to buy with it? [14:20] <pixolin> I have a Raspberry B+ which I actually only use as print server and web radio at my desk. I'm thinking about buying another one though which my kid (9 years old) could use to surf the web and print out stuff she needs for school. Would the new Raspberry Pi 2 be fast enough to browser websites (I'm not even talking about youtube or anything fancy)? [14:22] <E765> oh... I googled that and it seems like my Nexus 5 charger will work fine for it? [14:27] <eskimio> I was going to go with a dedicated power supply with an attached cord but, seeing as how I have so many micro usb cords lying around, is there any benefit or detriment towards purchasing a power supply which attaches via USB port so I can disconnect the cord and lengthen/shorten it if necessary? [14:28] <E765> Could I make a Model 1 B+ into an emulator station if I wanted to? [14:28] <eskimio> any recommended suppliers in the states for one? [14:29] <Berg> aditsu: wehat you gona use it for? [14:34] <knob2> Good morning guys. I want to buy via eBay the "jumper cables" that are female-female ends... what are they called? Can't find them using "jumper cables". [14:41] <nid0> "the internet" drops or just your chromecast disconnects? [14:43] <knob2> Berg, thank you! [14:44] <nid0> can you ping the outside world from your router/modem? [14:44] <nid0> so the modem's management interface loads but when you try to ping out it fails? with what error? [14:47] <knob2> Berg, yeah... after 5 minutes searching, I turned to the human-search of #raspberrypi =) Thanks man... just ordered a bunch. [14:53] <Berg> do you reconnect when your reboot modem? [14:54] <Berg> and your using wifi? [14:55] <Berg> is you wifi password protected? [14:57] <Berg> do you have port forwarding enabled on some machines? [14:59] <Berg> do they show on the list connected to modem? [15:03] <eskimio> that's what i said! [15:04] <nid0> my thoughts are either: modem overheating and causing an odd connection failure locally, or isp issue and (from what I know of comcast being the absolute pits) that would seem most likely. [15:05] <nid0> have comcast not done this? [15:06] <Berg> you had 2 modems? [15:07] <nid0> again - do comcast not just replace these modems if there's a chance they're broken? [15:31] <fred1807> is the broadcom chip used in any other board or hardware? [15:31] <shiftplusone> I don't know about that exact chip, but variations of it are. 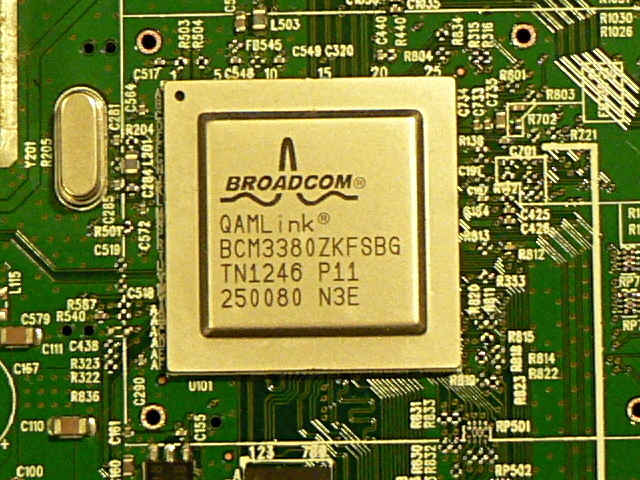 [15:32] <pksato> lots of set top boxes use broadcom chip, very simililar to use on RPi. [15:42] <thegorn> finally got u-boot + hyp + debian jessie + 4.1 kernel + btrfs root (with lzo compression) booting on my rpi2! [15:42] <annoymouse> Has anyone built OpenCV on their Pi? [15:44] <thegorn> have a build log of the failure? [15:47] <annoymouse> Anything else I should do out of the box? [16:02] <m1ndsurfer> What user should I run a vnc server as? [16:05] <m1ndsurfer> Right, but running it as my user feels wrong—I want anybody to be able to vnc in, and get a graphcial shell logged into their own account. [16:13] <shiftplusone> Ah, that's another question then and I don't know the answer. [16:13] <shiftplusone> There are ways to get a login manager going inside vnc, but I haven't done it myself. [16:26] <m1ndsurfer> Oh ok then, so it’s traditional to run a vnc instance per user. Fairy nuts. [16:31] <fred1807> I have a question.... The resolution (hdmi group and mode) and set on config... has anything to do with omxplayer? Or will omxplayer be independent of what is set there?? [16:32] <m1ndsurfer> Now if I could only get transmission-daemon to let me log in remotely I’d be gold. [16:56] <ctrlshftn> Guys any ideas for a weekend project? [16:57] <shiftplusone> My weekend project is catching up on sleep. [17:09] <nid0> a project for only one weekend, or several? [17:28] <fred1807> is omxplayer output independet of the resolution set in config (hdmi group and mode) ? [17:51] <day> im having some trouble with an sdcard. i put raspbian onto it via dd. then booted the raspb. from it. then wanted to readjust the root partition, which didnt work, as in i was unable to boot from it again. [17:58] <ShorTie> what did you do to 'readjust the root partition' ?? [18:00] <ShorTie> sure you used the correct 2nd partition start point ?? [18:01] <ShorTie> is this on a pi ?? [18:01] <ShorTie> or some other pc ?? [18:08] <thegorn> day: got another reader? [18:09] <day> i will boot into windows later on and try it there. [18:58] <Flerb> Is there are raspberry pi distro in which one can SSH into one's raspberry pi without connecting a display, keyboard, or mouse straight out of the box? [19:05] <Flerb> ShorTie: oh okay. So if I were to install raspbian to my SD card, there's no setup beforehand or anything? [19:05] <Flerb> I can simply find out what IP it's on and SSH? [19:06] <Flerb> I've been thinking of quite an interesting project in which my pi will transmit, at the same time as my alarm goes off, a daily briefing in which my emails received overnight, weather, and news is read. [19:20] <Flerb> Is there a way when using the Pi as an FM transmitter to reduce the output power? [19:28] <Apocx_> Did you put it on the UART TX/RX lines or just a random GPIO pin? [19:29] <Flerb> nid0: is there much risk of standing wave damage? [19:31] <Apocx_> alright. I'm trying to receive a 433.88 Mhz signal from a separate device using just the receiver but can't seem to get the receiver to show anything. not sure if I'm using the receiver wrong or if it for some reason can't read signals from the device. [19:33] <divx118> Receiving I yet have to try. Only used the send module for now. [19:39] <Zunz> Is there any good audio capture software that doesn't eat up so much cpu usage on a RPi? [19:40] <Flerb> day: so SSH is there by default? [19:41] <Flerb> day: that'd be using raspbian, not n00bs right? [21:04] <fred1807> anyone can send me a copy of compiled hello_font.bin ? please? [21:32] <melwyn> would it be possible to run a very small arduino board which can pull that "reset-switch" every X minutes? at the very best it could directly be programmed from the pi which it wakes up. [21:34] <wiiguy> IT_Sean what did you do ! [21:34] <IT_Sean> remind me never to push that button again. [21:36] <wiiguy> 5 more times ? [21:37] <wiiguy> ok my last offer 21 times !!! [21:37] <melwyn> gorroth: oh, that is interesting. and the avr can wake itself up? [21:41] <melwyn> gorroth: good point. would the arduino micro board be good enough already? [21:46] <melwyn> gorroth: ok, yes. it seems that the arduino-micro uses 5v. need to re-activate my electronics brain the next few weeks then :) i think i sometimes used an opto-isolator for such voltage "problems". [21:50] <melwyn> gorroth: a little refresh won't be bad, cheers! [21:50] <gorroth> how is it? [21:51] <traeak> bought or received ? [21:53] <traeak> and case too? [21:53] <IT_Sean> Cases are overrated. [21:59] <gorroth> so i'd do "sudo apt-get install zlib1g"
[22:02] <fred1807> do you have hello_font.bin ? [22:06] <_Trullo> sorry, wrong url. [22:14] <fred1807> gorroth: now I am stuck here: /usr/bin/ld: cannot find -lvgfont can you help me find this? [22:16] <notionSunday> can i post a link here of a finished project? [22:25] <traeak> _Trullo: do you know the current state of linux on allwinner h3 (orange pi pc, etal)? [22:55] <Kymru> evening, does anyone know where i can diagnose why i cant get my remote to work with MPC? [23:03] <Flerb> I'm trying to install something that depends on 2.8> python > 2.7.5. How do I upgrade the default installation? [23:13] <Kymru> fred1807, lol you know, care to share? [23:15] <fred1807> Kymru: so ... whats is missing? [23:19] <fred1807> what are you using to pass remote input to mpc? [23:22] <fred1807> Kymru: you have a ir interface added to it? [23:44] <K-202> Hi. What SD card is best for Raspberry PI 2 B? How much speed do I need? How about MicroSD SanDisk SDHC 16GB Extreme Pro UHS-1? How about other cards like Kingston or Goodram? [23:50] <K-202> ali1234, and what's the maximum speed that Raspberry PI is able to utilize? [23:53] <K-202> well but anyway is it worth to buy an expensive card like mentioned before? [23:53] <tantalus> any recommendations for a pi case that would also house a 3.5 hdd? [23:55] <ball> tantalus: Any reason you're going with 3.5" and not 2.5"? [23:56] <ball> tantalus: With a SATA->USB adaptor? [23:57] <ball> I must give up and go home.